The Annual Village Meeting is on Wednesday 23rd May at Hook Community Centre. The exhibition will include a number of Local Organisations, who will be on hand to discuss what they do. These include: Basingstoke Advanced Motorists, Hart and Rushmoor Live at Home Scheme, Hook Action Against Over Development, Hook Allotments, Hook Care Group, Hook Eagle Morris Men, Hook Focus, Hook In Bloom, Hook Local History Group, Hook and Odiham Lions, Hook Village Agent, Hook Village Halls Charitable Association, Odiham Cottage Hospital, Townswomen Guild, Patient Participation Group. This year we will abe welcoming a number of new exhibits from Hart District Council, in addition to the Dog Warden, Community Services (Housing and Disability Grants) and Hart Country Side Services. The meeting is not only a great way to meet other residents, whose paths you may not usually cross, but also an opportunity to meet some of the many organisations that provide local services. Importantly, the Annual Village Meeting enables you to ‘have your say’ in open forum about matters in Hook. Please be aware that the Community Centre Car Park will be CLOSED on Sunday 20th May, for the Annual Hook Fun Run and Road Races, which sets off from Hartletts Park at 10.00 am. Come along and cheer the runners on, or if you have a youngster, take part in the Under 5’s race at 9:45am. Please go to www.hookfunrun.com/ for more information. The Hook Village Show on Sunday the 15th July on Hartletts Park will be organised by the Parish Council in partnership with Hook and Odiham Lions Club, and supported by Odiham and Hook Rotary Club, to ensure this event is bigger and better than last year. The Show has been moved from September to July this year to improve the chance of good weather and to provide a full arena programme, which will include a stage for performers, as well as a good mix of approximately 50 stalls and other attractions for all ages. This has now been completed and some stones have been laid flat on the grounds of safety. There are a number of other graves, where it has been noted that works need to be undertaken to keep them safe. We will endeavour to contact the owners of these graves in due course. , send a hard copy to Hart District Council, Civic Offices, Harlington Way, Fleet, Hampshire, GU51 4AE. All documents are available in hard copy at Hart District Council, other local Parish Councils and Library’s within the Hart area. If you have any questions email to the address above or call 01252 774118. New Staff member – The Parish Council are pleased to announce the appointment of Serena Dolby to the Parish Council Office. She will be taking up the role of part time Bookkeeper. Serena has lived and worked in Hook for a number of years and we are delighted to welcome her to the Team. Cemetery Memorial Testing – Under the Parish Council’s duty of care and upkeep of burial grounds, memorial assessments will be undertaken in the near future in both Hook cemeteries. In some cases it may be necessary to lay the stones flat, in others remedial work may be required to ensure safety. To ensure work is carried out sensitively, if you know of, or have any connection with a grave in either cemetery, or have any concerns regarding the memorial works please contact the Parish Council office as soon as possible. RAF 100 celebrations in Odiham – Saturday 9th June 2018 – As part of the celebrations for the centenary of the Royal Air Force, a Box Cart Race event is being planned for the morning of Saturday 9th June 2018. The level of RAF theming. The lengths they have gone to, to achieve the RAF theme. There will also be a 200 table street party after the race and we will publish more information about this in due course.
. ASAP as we don’t have long to plan and build the cart. Hook Neighbourhood Plan – The Neighbourhood Plan Steering Group held two public consultations on the first Draft of the Hook Neighbourhood Plan during January. See page x for update.
. Closing date for nominations is by 27th April 2018. Hook Road Race and Fun Run – A reminder that the Community Centre Car Park will be CLOSED on Sunday 20th May, for the Annual Hook Road Race and Fun Run. See page x for more information. Hook’s 2017 Community Christmas Day lunch was again funded entirely by the kindness and generosity of Hook Fun Run & Road Races, Bell Cornwell, Hook & Odiham Lions Club, Whitewater Pharmacy, William Grant & Sons, Tesco, Rawlings Transport, Taylor Wimpey, Andwell Brewery, Hartletts Café and Hampshire County Council. Both the jolly band of dedicated volunteers, who gave their time to host the event, and those who attended had a wonderful time. Thank you everyone for your fantastic support! The South East Water works have started on Griffin Way South and are expected to take 27 weeks. There will inevitably be delays and traffic congestion, particularly during peak times. Whilst South East Water appreciate that these delays are frustrating, please be courteous to other road users and allow extra time for your journey. Update on how the work is progressing can be found at: https://corporate.southeastwater.co.uk/hook. At the January Parish Council meeting the Parish Precept for 2018–19 was set at £363,400. This means an average Band D household will pay £2.02 per week, equivalent to a pot of tea at a local café. The Precept covers the running costs of the variety of facilities, land management and services provided by the Parish Council. A number of new and exciting initiatives and events are planned for the coming year. We continue to offer free pre-application planning consultations and to work closely on the development of the Hook Neighbourhood Plan. We support a number of local organisations, events and charities. Where possible we obtain additional funding to enable enhancements to the facilities in Hook. Our thanks go to Hook Runners for organising and undertaking a litter pick around the centre of Hook. They collected 25 black bags of rubbish in one hour. This has made a positive difference to our village and deserves recognition and appreciation. Keen eyed residents may also have spotted brightly coloured or themed painted pebbles hidden around the village. This is part of a growing Facebook community called Hidden Rocks Hook. Many of our talented young (or young at heart) residents have produced and shared their mini works of art for others to see, photograph and relocate for others to find. Why not join the fun, contribute your own creation and help brighten the landscape. See the Hidden Rocks Facebook page for more information on participating. The Parish Council would like to wish all of our residents a happy new year. We have lots of exciting new things planned for 2018, so look out for updates in the usual places – Hook Focus, noticeboards, our website and on Facebook. Over the last 15 months the Parish Council Committees and administration have undergone a Structure Review. A number of changes h have been gradually implemented. This has created a vacancy for a new member of our team. We are looking to recruit a part time Bookkeeper/Finance Administrator. Please contact the Parish Council Office for more information. Closing Date for applications is 12th January 2018. The first Draft of the Hook Neighbourhood Plan will be open for public consultation from 15th January. Two consultation events are being held in January. Please come along to review and make comment on the plans. Hampshire County Council has around 3500 roadside salt bins located across the highway network. They have been checking and replenishing these in recent weeks. Following the consultation event that South East Water held on 29th November, just a reminder that the works on Griffin Way South will start on 8th January. Works are expected to take 27 Weeks and it is anticipated there will be delays and traffic congestion, particularly during peak times. Please allow extra time for your journey. If residents experience problems in and around Hook with potholes, streetlight faults, fly tipping, footpaths etc. the quickest way to get them fixed is to log on to www.fixmystreet.com. Three is also a link off the Parish Council website. All you have to do is enter the post code where the problem is located, or use the map to pinpoint the location, together with a short description of the issue. This will be forwarded to the correct authority for the specific problem. Residents say this system is usually extremely efficient and they did receive or could track progress with resolution of the problem. The Parish Council plans to host a Hook Community Christmas Lunch on Christmas Day again this year. Anyone who will be alone (of any age) on Christmas day can join the party for Christmas dinner, some fun, carol singing and to enjoy the company of others. This event is free for guests thanks to a number of local organisations, volunteers and sponsors who have been extremely generous in providing money, time and goods. or call the office on 01256 768687 for more information or to register your interest. The Parish Council is pleased to announce that Rob Cowell OBE has now joined the council. He has recently retired after serving 36 years in the RAF. Rob originates from Hampshire and moved to Hook in 2006, with his wife and two grown up sons. He enjoys tennis, golf and travel and gardening. Rob has a genuine desire to use his administrative and leadership skills in all committee activities, and relishes the opportunity to face the future challenges of Hook’s development. Please be aware that the Office will close at 12 noon on Friday December 22nd December and will re-open at 9am on Tuesday 2nd January 2018. The last year has seen an unprecedented increase in the number of Hook planning applications, submitted to Hart District Council (HDC). These include several large scale developments such as Owen’s Farm (West of Hook). Hook Parish Council’s Planning and Infrastructure Committee meets twice monthly to discuss such applications. As a statutory consultee, representing the local community’s interests, it continues to feedback local opinions though the submission of planning comments to HDC. A summary of the larger applications received and the Parish Council’s response to them can be found at http://hook.gov.uk/category/development/. If you do not have access to the internet, please contact the Parish Council for a paper copy. The official opening was a great success. Over 100 people enjoyed the sunshine when the park was officially opened by Ranil Jayawardena MP, who was accompanied by his young daughter. Wicksteed provided goody bags for every child. The Parish Council have been awarded £1,000 towards the refurbishment from the Tesco ‘Bags of Help’ Scheme. Thank you to all those who voted for the project with, their blue discs in Tesco’s. Thank you also to ‘Petals From Paula’ who donated the ribbons for the opening ceremony. The new play equipment enables greater accessibility, combining modern equipment with classic childhood favourites and provides a wonderful play venue for children of all ages. . The Parish council is a key link between the community and other tiers of local government. We have regular dialogue with Hampshire County Council highways and endeavour to keep residents informed of relevant matters. S E Water will commence installation of an essential new water main, between Griffin Way South and the roundabout on station road, on 8th January. This will be done in sections and will take until July to be completed. Traffic disruption is unavoidable, as traffic lights will be in operation. Hart District Council will take one or more of their green crates from the kerbside. If you would like an additional crate, they are free to collect from Hart District Council or the Parish Council office. Alternately, if you prefer to have a wheeled glass bin they are available from Hart District Council and cost £30. Please remember that wrapping paper, shredded paper, plastic packaging cannot be recycled and will need to go in your black bins. For more information about recycling, go to https://www.hart.gov.uk/waste-recycling or call 01252 622122. There has been a recurrence of break-ins to access cars keys from the house and steal the cars. With Christmas around the corner, make sure you secure your property. The Parish Councillors and the Office Staff would like to wish all our residents a Merry Christmas and a Happy New Year. At the closing date, one application had been received for the councillor vacancy on the Parish Council. The candidate will, therefore, be appointed at the Parish Council Meeting on the 1st November. A brief resume about the new councillor will be in December’s Focus. South Western Railway is proposing major changes to the rail service to Hook at peak times. Our local MP, Ranil Jayawardena is running a petition to persuade South Western Railways to change their proposal to reduce both the number of peak morning services from Hook to London Waterloo from five to two. The South Western Railway proposal is currently out for public consultation, which closes on 22nd December 2017. The annual Hook Schools Parents Association Fire Show and Fireworks will take place on Saturday 4th November. Hartletts Park car park will be closed from 4pm until the conclusion of the firework display. Please remove all vehicles from the car park before 4pm. The Parish Council plans to host a Hook Community Christmas Lunch on Christmas Day again this year. Anyone who will be alone on Christmas day can join the party for a free Christmas dinner, some fun, carol singing and to enjoy the company of others. This event is free for guests thanks to a number of local organisations, volunteers and sponsors who have been extremely generous in providing money, time and goods. The Hook Christmas Cracker team are busy putting together a programme of entertainment for 2nd December from 5pm. See http://www.hookchristmascracker.com for information. The lack public transport in Hart is a major problem for those who do not have access to a car or bus service; or who would prefer not to have to drive to the train station. It can make it difficult for some to find employment; and for others to attend their hospital appointments, do their shopping or even do every day essential visits to friends etc. For those with mobility problems it can lead to social isolation. Transport in Hart is a Group founded to establish whether there are ways of increasing the amount of road based public transport available to the community of Hart District and to see if there are better ways of integrating scheduled bus or train services, with proposals for new and improved Community Transport. The Group includes the 21 Town/Parish Councils in Hart, the 7 Voluntary Care Groups and the current Community Transport operators. The Hook Village Show took place on the 10th September and was well attended despite the weather. The Parish Council stand was popular with children, who were busy entering the Vegetable and Treasure Hunt competitions. The winner of a Smart Phone (donated by a local resident) for the Vegetable Hunt was Daniel Parsons and Ollie Turner won a bag of gold (£10 in coins) for the Treasure Hunt Our thanks go out to all those who braved the elements to help with the multitude of tasks on the day. At the time of writing, work on replacing the play area is due to start at the end of September. The contractor hopes to complete the work by the 23rd October. The play area will be closed during the refurbishment work. The reopening date will be announced in October, but may be subject to change, depending on the weather conditions. We will publish updates via our notice boards and Facebook page. Below is the updated graphic image of what the new park will look like. As you may be aware, on the evening of Monday 4th September, the skate park ramps were heavily sprayed with graffiti. The Parish Council routinely paints the ramp surfaces with a special ‘grippy’ paint to improve safety. The areas of the ramps covered in graffiti were slippery and our Independent Play Inspector advised that the sudden change of ride surface, from grip to slip, part way across the ramp created an unnecessary hazard. This was also confirmed by several skaters. The Council took steps to rectify the problem and re-open the park as quickly as possible. The Council has a zero tolerance policy on graffiti in general and endeavours to remove it where possible. The exception to this has been to allow the young people using the skate park to graffiti the upright walls, but not the ramps, provided it is not rude or offensive. This policy has worked well and has been respected by our local youth and skate park users. It is a pity those responsible have caused such inconvenience to the users and expense to the Council. This was not the only area of Hook that fell victim to graffiti and the Police are following up on information about possible perpetrators. Last year the first Hook Community Christmas Lunch was held on Christmas Day. Anyone who alone on Christmas day was able to join the party for a free Christmas dinner, some fun, carol singing and to enjoy the company of others. A number of local businesses were extremely generous in providing both money and goods. A large team of local people volunteered to help with a host of tasks including decorating the hall, cooking, serving food, transport etc. The Parish Council plans to host the lunch again in 2017. We will be in contact with those who attended last year, but if you think you may be alone on 25th December, or you know of someone, who will be then please get in contact with the Parish Council office. There is no age restriction for joining in and transport can be arranged on request. If you will be alone, but could not to the Community Centre, we may be able to arrange for Santa and his helper to deliver a Christmas Dinner, so please do get in contact.
. Police Car – meet your beat officer and PCSO, sit in a police car, turn on the sirens and lights; crime prevention information available; dressing up kit for children and colouring fun. Dog Show – Hart District Council’s Dog Warden will be running a dog show. Enter your dog on the day in one or more categories, which include: dog in best condition, best handler under 16 and dog with the waggiest tail. Tug of War Contest – Enter a team of 4 people for the chance to win £100 cash. £5 entry per team. Prior registration required. Classic Cars – There will be a selection of classic cars on display. There will also be the Food and Produce show on in the Community Centre between 2pm – 4pm with the prize giving for the winners at 4pm. Radio Frimley Park are the resident DJ’s for the day and will compere the event. Event information will be updated on the Parish Council’s Facebook page as attractions are added. The Councillors and staff look forward to seeing you there. As the school are re-opening after the summer, this is just a reminder to be courteous to other drivers using the Hook Community Centre Car Park, as it can get very congested. This car park is primarily for users of Hartletts Park and Hook Community Centre, but the Parish Council permits it to be used for school drop off and pick up. Please do not park in the staff or disabled parking (without a blue badge) or on the yellow lines at any time. The schools can be contacted for more information on parking at Crossways Car Park. 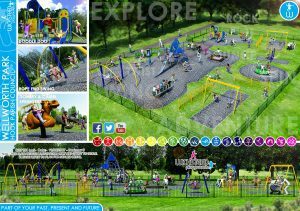 Following the Parish Council meeting on the 2nd August, Wickstead (Design A) was awarded the contract for refurbishing the play area. A final scheme, based on Design A is being in prepared, ready for work to commence in September. Thank you to everyone who responded to the surveys; your input and comments were greatly appreciated and assisted in the decision making process. Please see next month’s Focus and the Council’s Facebook page for updates on the reopening of the play area. – Any written materials available can be submitted at least 24 hours before the meeting to the Executive Officer for circulation to Councillors. 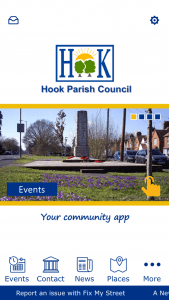 Would you like to become a Hook Parish Councillor? There is a current vacancy for a Parish Councillor. If you have a strong interest in your local community and would like to shape the future of Hook, then this is the role for you. The time required to carry out the role varies depending on individual interests and Committee involvement. Attending relevant meetings and active participation, as part of a team, is essential. A commitment to attend training, support Council activities and events would also be expected. Meetings and community activities can take place during the day, evening or weekends. Full Council meets on the first Wednesday of every month. Planning & Infrastructure (P&I) – meets every fortnight on a Wednesday evening. Environment & Community (E&C) – meets on the third Wednesday of every month. Finance, Strategy & Resources (FSR) – meets every two months on a Tuesday evening. your interests and recent career history. The closing date for applications is 15th September. Candidates will be invited to an informal information evening on 28th September to meet Councillors and the Executive Officer. Co-option will take place at the Parish Council meeting on 1st November 2017. Please contact the Executive Officer, Anne Atkins, for more information or a chat about this rewarding role.